Bu araştırmanın amacı ilkokullarda görev yapan öğretmenlerin çevreye yönelik tutumlarını belirlemektir. Araştırma 2012-2013 eğitim-öğretim yılı güz döneminde yapılmıştır. Araştırma, enlemsel tarama modeli kullanılarak gerçekleştirilen betimsel bir çalışmadır. Araştırmaya 53 farklı ilden toplam 878 öğretmen katılmıştır. Araştırmada veri toplama aracı olarak Çevresel Tutum Ölçeği kullanılmıştır. Araştırma sonucunda öğretmenlerin çevreye yönelik yüksek tutuma (M= 170.42, ss= 15.94) sahip oldukları tespit edilmiştir. Çalışmadan elde edilen bulgular kadın öğretmenlerin erkek öğretmenlere göre çevreye yönelik daha olumlu tutum sergilediklerini göstermiştir (U= 83694, z= -3.18, p= .001, r= 0.1). Mesleki kıdem değişkeni açısından 1-5 yıllık hizmete sahip olan öğretmenlerin (Md= 173, n= 211), 26 yıl ve üstü hizmete sahip öğretmenlere (Md= 166, n= 54); 16-20 yıllık öğretmenlerinde (Md= 174, n= 158), 26 yıl ve üstü hizmeti olan öğretmenlere (Md= 166, n= 54) göre daha yüksek olumlu tutum sergiledikleri sonuçlarına ulaşılmıştır. Öğretmenlerin çevreye yönelik tutumlarının olumlu olması şüphesiz ki öğrencilerine de yansıyacaktır. Bu nedenle, araştırmacılar öğretmenlerin çevreye yönelik tutumlarının belirlenmesinin önemine inanmaktadır. The purpose of the present study is to determine elementary school teachers’ attitudes towards environment. The study was conducted in the fall term of 2012-2013 school year. The study is a descriptive study employing cross-sectional survey model. Totally 878 elementary school teachers from 53 different cities participated in the study. As a data collection tool, Environmental Attitude Questionnaire was used. As a result of the study, it was found that the teachers have high level of positive attitudes towards environment (M= 170.42, ss= 15.94). Moreover, it was found that the female teachers have more positive attitudes towards environment than the male teachers (U= 83694, z= -3.18, p= .001, r= 0.1). In terms of professional seniority variable, the teachers having a length of service ranging from 1 to 5 years have more positive attitudes (Md= 173, n= 211) than the teachers having a length of service of 26 year and more (Md= 166, n= 54); and the teachers working for 16-20 years have more positive attitudes (Md= 174, n= 158) than the teachers working for 26 years or longer (Md= 166, n= 54). Blair, M. (2008). Community environmental education as a model for effective environmental prog- rammes. Australian Journal of Environmental Education, 24, 45-53. Bielschowsky, I. A., Freeman, C. & Vass, E. (2012). Influences on children’s environmental cognition: a com- parative analysis of New Zealand and Mexico. Environmental Education Research, 18(1), 91-115. Boewe-de Pauw, J. & Van Petegem, P. (2010). A cross-national perspective on youth environmental attitudes. Environmentalist, 30, 133-144. Bord, R. J. & O’Connor, R. E. (1997). The gender gap in environmental attitudes: The case of perceived vulnerability to risk. Social Science Quarterly, 78(4), 830- 840. Campbell, T., Jerez, W. M., Erdoğan, I. & Zhang, D. (2010). Exploring science teachers’ attitudes and knowledge about environmental education in three international teaching communities. Internatio- nal Journal of Environmental & Science Education, 5(1), 3-29. Caro, T. M., Pelkey, N. & Grigione, M. (1994). Effects of conservation biology education on attitudes toward nature. Conservation Biology, 8, 846-852. Chatzifotiou, A. (2006). Environmental education, national curriculum and primary school teachers. Findings of a research study in England and possible implications upon education for sustainable development. The Curriculum Journal, 17(4), 367-381. Cheng, J. C. H. & Monroe, M. C. (2010). Examining teachers’ attitudes toward a required environmen- tal education program. Applied Environmental Education & Communication, 9(1), 28-37. Coertjens, L., Boewe-de Pauw, J., Maeyer, S. & Van Petegem, P. (2010). Do schools make a difference in their students’ environmental attitudes and awareness? Evidence from Pisa 2006. International Journal of Science and Mathematics, 8, 497-522. Çepni, S. (2012). Araştırma ve proje çalışmalarına giriş. (Altıncı Baskı). Trabzon: Celepler Matbaacılık. Eagles, P. F. J. and Demare, R. 1999. Factors influencing children’s environmental attitudes. Journal of Environmental Education, 30(4), 33-37. Erkuş, A. (2011). Davranış bilimleri için bilimsel araştırma süreci. (3. Baskı). Ankara: Seçkin Yayıncılık. Erol, G. H. & Gezer, K. (2006). Prospective elementary school teachers’ attitudes towared environment and environmental problems. International Journal of Environmental and Science Education, 1(1), 65-77. Erten, S. (2005). Okul öncesi öğretmen adaylarında çevre dostu davranışların araştırılması. Hacettepe Üniversitesi Eğitim Fakültesi Dergisi, 28, 91-100. Erten, S. (2008). Insights to ecocentric, anthropocentric and antipathetic attitudes towards environment in diverse cultures. 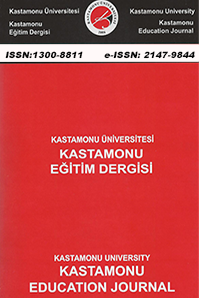 Egitim Arastirmalari - Eurasian Journal of Educational Research. 33, 141-156. Esa, N. (2010). Environmental knowledge, attitude and practices of student teachers. International Re- search in Geographical and Environmental Education, 19(1), 39-50. FAO. (2013). FAO statıstical yearbook 2013. World food and agriculture. Roma. Gough, A. (2011). The Australian-ness of curriculum jigsaws: where does environmental education fit? Australian Journal of Environmental Education, 27(1), 9-23. Gökçe, N., Kaya, E., Aktay, S. & Özden, M. (2007). İlköğretim öğrencilerinin çevreye yönelik tutum- ları. İlköğretim Online 6(3), 452-468. Hes- Quimbita, G. & Pavel, M. (1996). Assessing an environmental attitude development model: Fac- tors influencing the environmental attitudes of college students. ERIC Document Reprodaction Service No. ED 394438. IUCN (1970). International working on environmental education in the school curricilum, Final report. September, IUCN USA. Kaga, Y. (2008). Early childhood education for a sustainable world. In I. P. Samuelsson ve Y. Kaga (Eds. ), The contribution of early childhood education to a sustainable society (s.53-57). Paris, Fran- ce: UNESCO Publishing. Kağıtçıbaşı, Ç. (2010). Günümüzde insan ve insanlar. (12. Basım). İstanbul: Evrim Yayınevi. Kahriman- Öztürk, D., Olgan, R. ve Güler T. (2012). Preschool children’s ideas on sustainable develop- ment: How preschool children perceive three pillars of sustainability with the regard to 7R. Kuram ve Uygulamada Eğitim Bilimleri, 12(Special Issue), 2987-2995. Kandır, A., Yurt, Ö. & Cevher Kalburan, N. (2012). Okul öncesi öğretmenleri ile öğretmen adaylarının çev- resel tutumları yönünden karşılaştırılması. Kuram ve Uygulamada Eğitim Bilimleri, 12(1), 317-327. Lahiri, S. (2011). Assessing the environmental attitude among pupil teachers in relation to responsible envi- ronmental behavior: A leap towards sustainable development. Journal of Social Sciences 7 (1), 33-41. Larson, L. R., Castleberry, S. B. & Green, G. T. (2010). Effects of an environmental education program on the environmental orientation of children from different gender, age, and ethnic groups. Journal of Park and Recreation Administration, 28(3), 95-113. MEB. (2005). İlköğretim fen ve teknoloji dersi (4. Ve 5. Sınıflar) öğretim programı. Ankara. MEB. (2012). Okul öncesi eğitim programı. Ankara. Oerke, B. & Bogner, F. X. (2010). Gender, age and subject matter: Impact on teachers’ ecological valu- es. Environmentalist, 30, 111-122. Ogelman-Gülay, H. (2013). Tipitop ve arkadaşları ile toprağı tanıyoruz 4: Çocuklarla toprağı tanıma serüveni. Muş Alparslan Üniversitesi Sosyal Bilimler Dergisi, 1(2), 9-23. Özsoy, S. (2012). A survey of Turkish pre-service science teachers’ attitudes toward the environment. Eurasian Journal of Educational Research, 46, 121-140. Özsoy, S., Özsoy, G. & Kuruyer, G. (2011). Turkish pre-service primary school teachers’ environmental attitudes: Effects of gender and grade level. Asia-Pacific Forum on Science Le- arning and Teaching, 12(2). Pallant, J. (2011). SPSS survival manual. A step by step guide to data analysis using SPSS. (Forth Editi- on). Avustralya: ALLEN & UNWIN. Palmer, J. A. (2003). Environmental education in the 21 st Century, theory, practice, progress and pro- mise. New York: Routledge. Pedretti, E., Nazir, J., Tan, M., Bellomo, K. & Ayyavoo, G. (2012). A baseline study of Ontario teachers’ vi- ews of environmental and outdoor education. The Ontario Journal of Outdoor Education, 24(2), 4-12. Sama, E. (2003). Öğretmen adaylarının çevre sorunlarına yönelik tutumları. Gazi Eğitim Fakültesi Der- gisi, 23(2), 99-110. Schultz, P. W., Shriver, C., Tabanico, J. J. & Khazian, A. M. (2004). Implicit connections with nature. Journal of Environmental Psychology 24, 31–42. Snaddon, J. L., Turner, E. C. & Foster, W. A. (2008). Children’s perceptions of rainforest biodiversity: Which animals have the lion’s share of environmental awareness? PlosONE, 3(7), 1-5. Tuncer, G., Ertepınar, H., Tekkaya, C. & Sungur, S. (2005). Environmental attitudes of young people in Turkey: Effects of school type and gender. Environmental Education Research, 11(2), 215-223. Tuncer, G., Sungur, S., Tekkaya, C. & Ertepınar, H. (2007). A comparative study on pre-service teac- hers’ and elementary students’ attitudes towards the environment. International Research in Geog- raphical and Environmental Education, 16(2), 188-198. TÜBA. (2006). Dünya’da ve Türkiye’de biyolojik çeşitliliği koruma. Ankara: TÜBA Yayınları. UN.(1993). Agenda 21: Earth summit: The United Nations Programme of Action from Rio. New York: United Nations. UN. (2012). The future we want. New York: United Nations. UNEP. (2013). 2012 annual report. Katmandu. UNESCO-UNEP. (1975). The international workshop on environmental education. Belgrade final re- port. Paris: UNESCO. UNESCO-UNEP. (1977). Intergovermental conference on environmental education. Tbilisi final re- port. Paris: UNESCO. UNİCEF & MEB (2013). Okul öncesi eğitimi ihtiyaç analizi raporu. Ankara. Volk, T. L. & Cheak, M. J. (2003). The effects on an environmental education program on students, parents and community. The Journal of Environmental Education, 34(4), 12-25. Watson, K. & Halse, C. M. (2005). Environmental attitudes of pre-service teachers: A conceptual and methodological dilemma in cross-cultural data collection. Asia Pacific Education Review, 6(1), 59-71. Wiersma, W. & Jurs, S. G. (2005). Research methods in education. (Eight Edition). Boston: Allyn and Bacon. WRI. (2000a). Pilot analysis of global ecosystem. Forest ecosystem. Washington DC. WRI. (2000b). Pilot analysis of global ecosystem. Freshwater ecosystem. Washington DC. Yıldırım, C., Bacanak, A. & Özsoy, S. (2012). Öğretmen adaylarının çevre sorunlarına karşı duyarlılık- ları. Kastamonu Eğitim Dergisi, 20(1), 121-134. ISNAD AHİ, Berat , ÖZSOY, Sibel . "İLKOKULLARDA GÖREV YAPAN ÖĞRETMENLERİN ÇEVREYE YÖNELİK TUTUMLARI: CİNSİYET VE MESLEKİ KIDEM FAKTÖRÜ". Kastamonu Eğitim Dergisi 23 / 1 (January 2015): 31-56.